This year at InfoComm, Powersoft introduced new products aimed at the fixed installation and OEM markets. 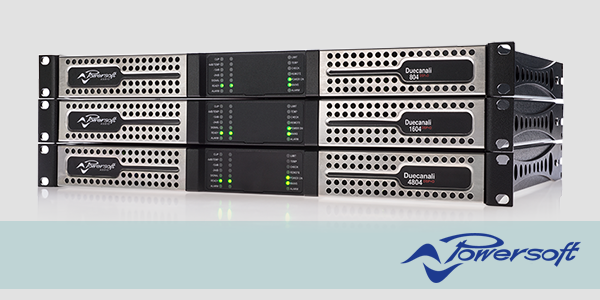 Most notably, the popular Duecanali two-channel amplifier platform received a significant extension. New to the Duecanali lineup are Duecanali 804 and 4804, perfectly suited for retail, leisure and hospitality fixed installations that require both pristine and reliable sound. The Duecanali 804 offers 2 x 400W and represents a lower total power solution for installations in retail, as well as bars and restaurants where a single two-channel amplifier is required — without the need for additional channels or power. The range is completed by the existing Duecanali 1604 launched last year, which sits between the two new products in the Duecanali range. Read the full article from AV Magazine. See more about Duecanali on the Powersoft website. Download the Duecanali data sheet.